Two More Thirds Make Four! 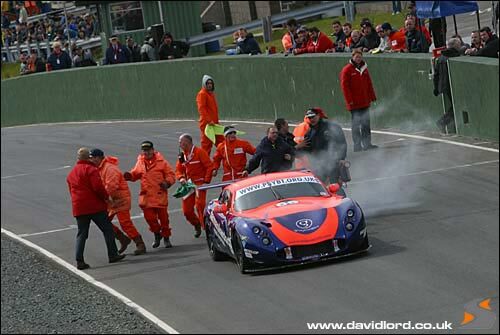 A disastrous engine failure for the #69 TVR T400R during Friday testing at Scotland’s quick and twisty Knockhill circuit could easily have ended Eclipse Motorsport’s weekend. But an overnight dash by the crew back to the TVR factory in Blackpool and a titanic effort by John Griffiths and the boys saw a fresh straight six installed by 5am on Saturday morning. Team boss John Griffiths wanted to ensure the job had been done properly and fired up the TVR for a couple of test engine runs, and the calls to the circuit office from a farmer fully two miles away showed that the engine had indeed been restored to full health! Saturday morning saw a trail of visitors to gawp at the broken engine. The hole in the side of the block was mightily impressive, the engine seemed good only for scrap but will instead find re-use as an ornament in Shane Lynch’s rather large aquarium. 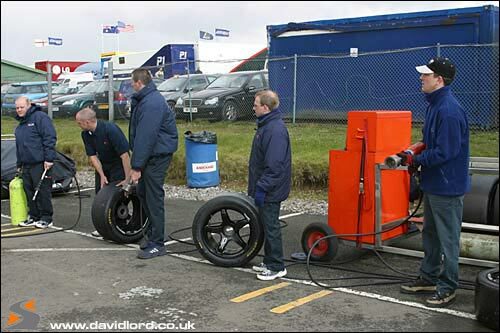 The real proof of the quality of the engine transplant would come in the Saturday morning free practice session. After a few trundling laps to check everything was properly bedded, in Piers Johnson gave it everything. He ended the session with second fastest time overall, splitting the all conquering Mosler MT900Rs, which were still very quick here - on a circuit which many had predicted would suit the TVRs better. With a double header of 40 minute sprint races ahead, there were points to be won and scalps to be taken IF the Moslers showed a weak spot that had not so far been exposed this season. The session had however exposed another area worthy of the teams’ attention. A 40 minute race including a driver change would mean that pit strategy and a swift turn-around would be critical. The two Mosler teams had displayed remarkable swiftness during practice changeovers in qualifying, so it was back to the awning for some concentrated practice. Mickey (in the middle, above, with the blue gloves), was of course thrilled with all the attention, and by all accounts played to the crowd at a Stirling nightspot on Saturday evening. The pretence held out right up until he hit the dance floor, when it emerged that sadly his moves were more wooden than Noah’s Ark. Sorry Mickey! He pushed on hard though, because traffic and the weather could still play a part. 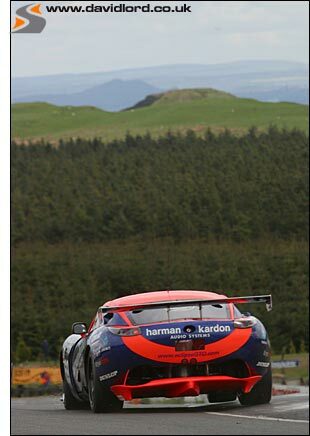 And so could the Safety Car! The early advantage of the Moslers was wiped out when the #31 Jaguar XK8 of Allen Lloyd found itself in the tyre wall. The Safety Car came out to control the field and with the clock ticking towards the ten minute mark when the pit widow would open, race strategy came to the fore. 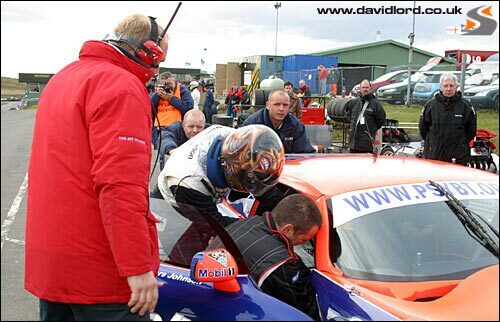 The first car to pit as the window opened and the SEAT safety car was withdrawn was the second placed #22 Mosler, Tom Herridge passing on the reins to Rob Barff: the Mosler rejoined, now down in 13th place. Piers was up to second and using the clear track ahead to his advantage. But Balfe was making good his escape as others diced behind him. Piers was next to stop and the overnight pit stop practice was put to good use, Shane Lynch emerging ahead of Barff, still second but with the ‘blue’ Mosler closing in just three seconds back. With just two minutes of the 20 minute pit stop ‘window’ remaining the leader pitted, more than 40 seconds to the good at that point, and another well drilled stop saw the lead retained as Jamie Derbyshire rejoined. 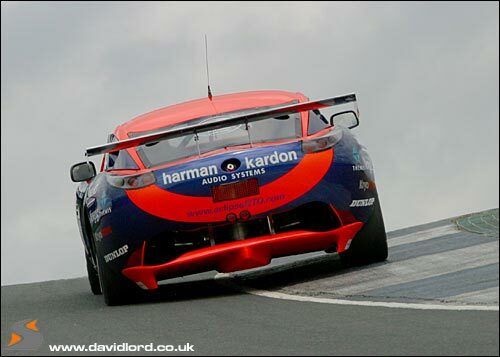 Barff was now pushing hard though, closing up onto the bootlid of the Eclipse TVR and carving time out of the leader too. Shane was the first target and as the two roared along the start finish straight the Englishman made his move, the Irishman defending vigorously. “Firm but Firm” was one onlooker’s reaction, there was contact and both cars had a very quick trip into the gravel, the Mosler bouncing high but making the move stick. With no way to close the gap again and no pressure from behind, Shane eased off a little. A third consecutive third place was secure, just seventeen seconds behind the leader after 44 frenetic laps. As the grid cleared for the start of Round 4 of the British GT Championship, the second 40 minute race on Sunday afternoon, a waved yellow flag alongside the second row of the grid spelled bad news for Shane Lynch and Eclipse Motorsport. The #69 TVR T400R refused to fire up as the grid set off on its reconnaissance lap. A push start from the start line marshals succeeded in breathing life into the big straight six and Shane roared round to join the back of the grid: the red mist had no doubt fallen well and truly on the Irishman! Should that be green mist? Shaun Balfe again hared into a substantial lead, but Shane was already making good progress through the Cup class runners. He soon found a Mosler in his sights, Tom Herridge having bounced through the gravel trap at the hairpin and fallen from second to ninth, just a metre or two ahead of #69. That alone meant that Shane had passed seven cars in the opening two laps…. It was Tom Herridge’s turn to get that red mist now: he was pushing very hard to recover lost ground but the Eclipse TVR was still in close attendance. Shane was cleverly using the Mosler as a pathfinder through traffic, perhaps hoping to pressure the Mosler driver into another error. It nearly worked too as the #33 car got tangled up with the Xero Racing Corvette in a tussle for third place. The contact was brief and the Mosler continued unhindered, but the squabbling pack behind were gobbled up by Lynch and he was through to fourth. 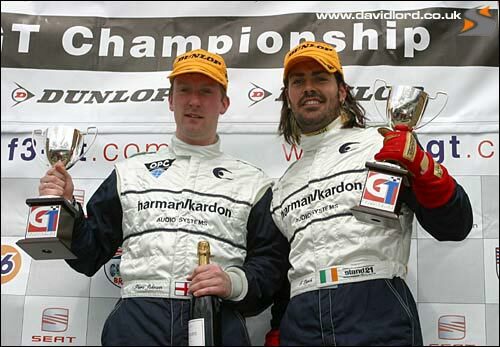 Herridge eventually found his way past Gareth Evans in the CDL Racing TVR T400R for second at Clark before Shane too began to close down on Evans. The latter did a fine job of keeping a ducking, weaving Lynch at bay but eventually the Eclipse car and driver’s pace showed and the orange car was through into third from the back of the grid, a fine drive again from Shane. At the front of the race it was a Mosler vs Mosler battle again, and again the #33 car was getting the better of it. 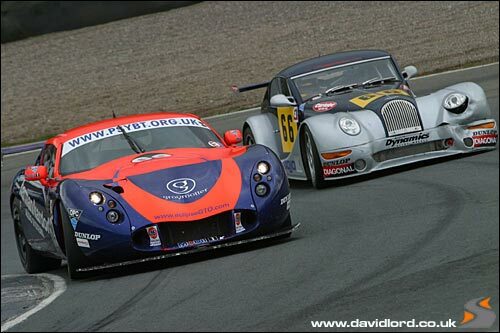 Piers Johnson had by now taken over the Eclipse TVR (above), and despite his best efforts he would chase the Moslers in vain. The two American cars would finish in the same order as for Race 1, with Johnson and Lynch again completing the podium. So the Moslers are edging away in the points battle, but the consistency of Eclipse Motorsport (four third place finishes in a row) sees them still well in touch. 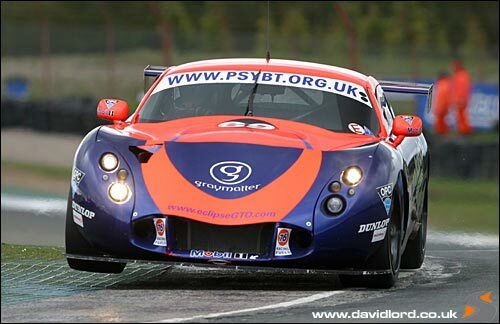 The TVR runners will be hoping for good luck for themselves and bad luck for the Moslers at Round 5 in two weeks time, an epic three hour tussle on Silverstone’s Grand Prix circuit.